Olivine Love, the oldest daughter of the Reverend Everlasting Love, is tired of traveling. Being the child of an itinerant preacher means three days tops in a town before packing up and heading off to the next stop, and though she loves her dad, Ollie is ready to settle down somewhere with flush toilets, electricity, and ice. They pull into Binder, Arkansas, one hot, sticky morning in the summer of 1957, and Ollie good-naturedly sets off to deliver flyers inviting the townspeople to the service that night. She meets some kind people, some mean ones, and then there's Jimmy Koppel. Scrawny, dirty, and about her age, Jimmy hesitates when Ollie encourages him to come to the revival. She learns from the taunting of other kids that his father is dead and his mother is in jail for the murder, but she's moved by "the sorrow buried in that poor boy's eyes--sorrow too deep for someone so young." Determined to help Jimmy, who is convinced of his mom's innocence, Ollie asks her dad if they can stay in Binder a little longer than their usual three days, just this once. The whole family, including Ollie's four younger sisters, gets involved in seeing that justice is done. Hilmo has created a family full of interesting characters in the Loves. They all have different strengths and dreams, but they pull together to support each other. Ollie's descriptors are delightful and spot-on. One person gives her "the pure and undefiled willies." Another sells "full-up bottled hatred"at her story. Ollie loved another "like a bee loves a fat flower." Her daddy "loves people and loves the Lord and just wants to get the two together." Hilmo's done an incredible job with the setting, too. The small, sleepy, rundown southern town of Binder becomes almost another character itself. While some of the minor characters are pretty one-dimensional, others have some surprising depth to them, like the Sheriff who isn't interested in an actual investigation of Henry's death - he's just happy to have a confession regardless of whether it's true or not - but who shows up with his son to clean some gruesome vandalism at the church. 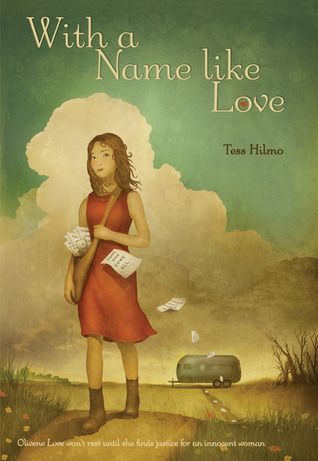 With a Name Like Love is a short, sweet story of a young girl finding her way in a life that doesn't suit her much, but making the best of it and refusing to turn away from someone in need regardless of the cost to herself. She learns a bit about human nature - both the good and the bad - and makes some grown-up decisions including when to let go and move on.